Add these stools to your entertainment space for the ideal look for your home bar. 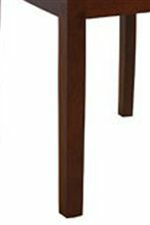 Block legs and a stretcher covered in a rich finish add a handsome look that will fit in with any home decor. The plush, leather seats are covered in your choice of either leather color so you can find a look that works beautifully in your home. Place your feet on the stretcher and relax the night away as you unwind for the perfect night in. The Parson Chairs 24" Red Backless Swivel Barstool at Walker's Furniture in the Spokane, Kennewick, Tri-Cities, Wenatchee, Coeur D’Alene, Yakima, Walla Walla, Umatilla, Moses Lake area. Product availability may vary. Contact us for the most current availability on this product. Beautifully contemporary and modern, this handsome Parson Chairs collection is just the thing you have been looking for for your dining room. You have a wide variety of choices for seating at your dining table and bar with this collection. Choose from side chairs, benches, and bar stools to create a look that is unique to your home. A rich finish brings out your choice of either colored leather to accent your dining room perfectly. Block legs add the ideal final finishing touch of modernity that you are sure to love. The Parson Chairs collection is a great option if you are looking for Contemporary furniture in the Spokane, Kennewick, Tri-Cities, Wenatchee, Coeur D’Alene, Yakima, Walla Walla, Umatilla, Moses Lake area. Browse other items in the Parson Chairs collection from Walker's Furniture in the Spokane, Kennewick, Tri-Cities, Wenatchee, Coeur D’Alene, Yakima, Walla Walla, Umatilla, Moses Lake area.